In early January this year Stephen Few introduced the concept of Bandlines. He identified a useful extension to Sparklines, making use of shaded or coloured horizontal bands to provide more information on the context of the trend line itself. See Stephen’s article on Bandlines and the thinking behind them for a detail description. 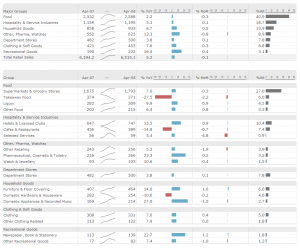 The Sparklines are ideal for showing individual trends in a small amount of screen real estate, and we use them extensively in dashboards, typically in a ‘visual table’. By definition Sparklines are small, and to make the trend easily readable, they are typically scaled individually so that each Sparkline uses the whole vertical axis. This means they do not give any impression of the scale of the numbers involved across different rows. It’s possible to use a common scale, and while sometimes that works more often it means many of the rows with smaller values are excessively flattened. Bandlines address this by introducing horizontal shaded areas depicting the lower, middle and upper quartiles and the median represented by a line. The user can determine the context of the bands. The two most common examples would be plotting recent trend in the context of a longer period, or plotting individual rows in the context of the overall set of data being displayed. We think Bandlines add real value, so hats off once again to Stephen, and we’re pleased to say that Bandlines are now available in the current version of XLCubed (see here for more detail). The screenshots below show two examples, displayed in two colour schemes. The charts depict historic margin by store. 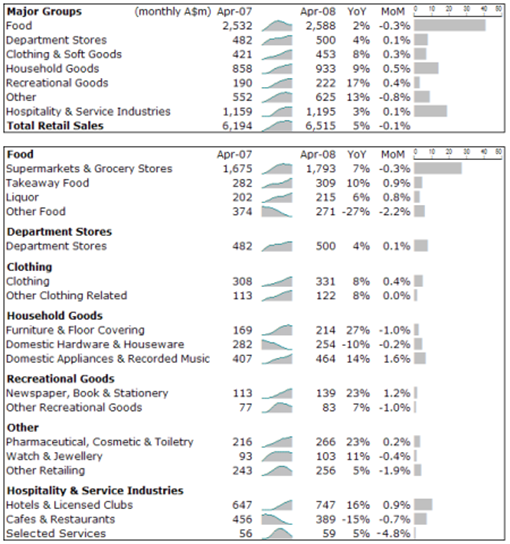 The ‘Banding across all stores’ charts show the 30-day trend for the individual store, set in the quartile context of the data for all 11 stores in the table. 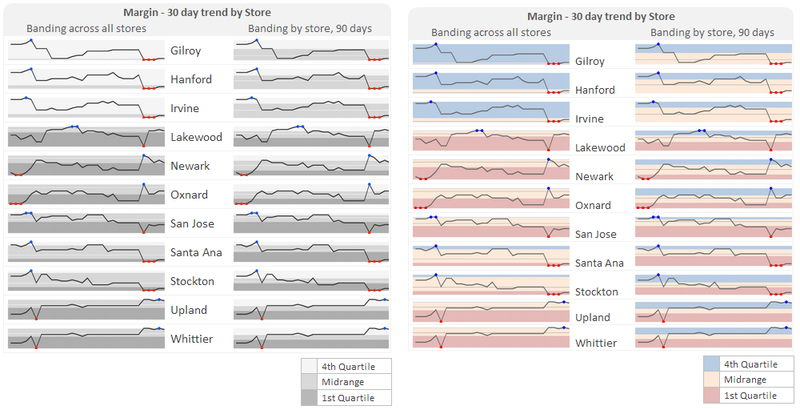 We can see that for the Gilroy store in row 1, while the margin has varied, it remained in the top quartile when set against all stores for almost the whole period. The ‘Banding by store, 90 days’ charts show the individual 30 day trend, set in the context of the previous 90 days for the individual store. This helps provide much more historical context, but the line itself still focuses on the more recent trend. Stockton is probably most noteworty here as across the 30 day period it has dropped from the top quartile into the 1st quartile across the whole 90 day period. We’d love to hear your thoughts (and also which colour scheme works best! ), we will also be adding Sparkstrips in the near future so watch this space. 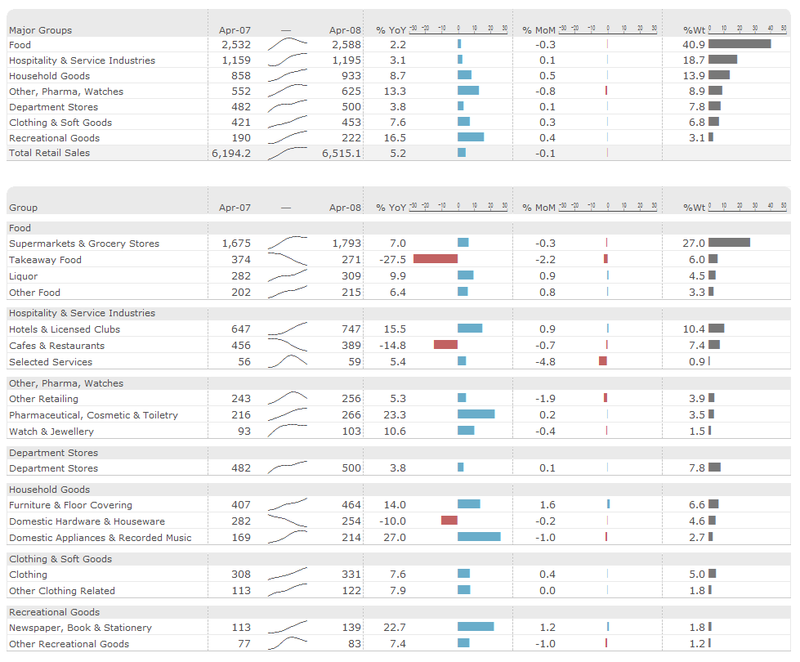 This blog post is the first in a series of blog post that features the winners of the 2008 Excel dashboard competition. 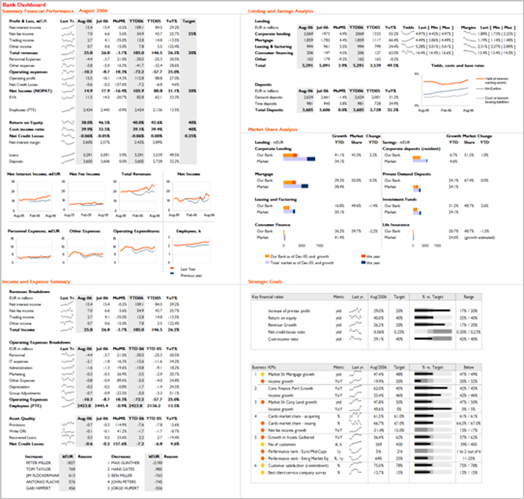 Data logic and calculation : YTD figures, variances, etc…. 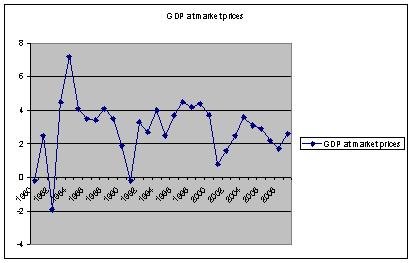 2) In Small Multiples – Abortion Data 1980-2003, I have written about Jorge’s panel chart. I like the panel (small multiples) chart, but felt that it can be improved. 3) Jon Peltier posted on Re: Abortion Ratios 1980-2003 and Interactive Multiple Line Chart some nice Excel techniques to create interactive charts to analyze the Abortion data set. This chart looks nice on the first view. It makes nice use of muted colors, the shapes look well balanced and certainly the graphic designer did a good job. However, from a data visualization perspective this chart has a couple of flaws. Ben Shneiderman designed Treemaps to visualize deep directory tree structures. 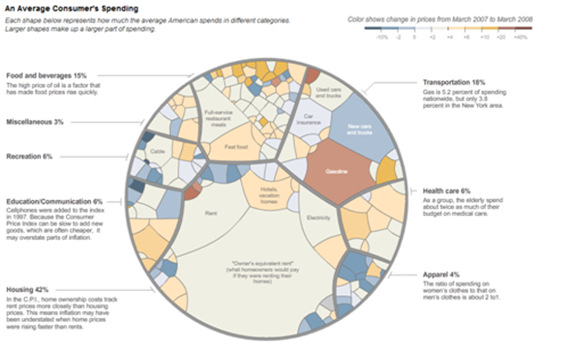 The first problem the NYT chart has is that it does not visualize the hierarchy as rectangular areas. The inflation drivers are visualized as asymmetric round shapes. It is difficult to compare the relative size of rectangular shapes but it gets almost impossible for asymmetric shapes. 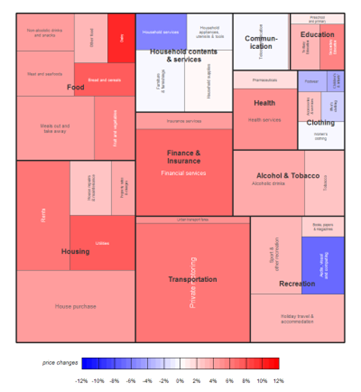 Also does this treemap lack labels for the smaller inflation drivers. Ben designed treemaps to visualize thousands of regions, products, etc ; but the Inflation chart only comprises 20 Inflation Drivers grouped into 7 categories. A simple sorted table would do a better job communicating the numbers as Kaiser Fung from Junk Junks wrote in his post. Inspired by this post and my comment Sean came up with this graphical sparkline table designed with Excel and MicroCharts. This is already quite an improvement on the treemap, as we can see increasing and decreasing inflation trends and sparklines rather than traffic light colors as in the tree map version. Also it is much easier to read for non expert users. Well, since you are reading this, I’ll assume that you took the red pill, so let’s keep moving and find out how deep the rabbit hole goes. We saw that people usually design charts larger than they need to be. Why? Is it because we can’t fit the data into a smaller space? No, it isn’t. It is because in smaller charts there is no room for non-data elements, like title, legend, grid lines. In the dominant “Excel chart defaults” school of thinking data is not a priority. The title and the legend win, as usual. The data must be here somewhere, but who cares? With MicroCharts, you can add a “normal band” or a reference line that helps you to understand how the data departs from the expected values. Michelangelo said: “I saw the angel in the marble and carved until I set him free“. Like him, keep carving your chart until you set your data free. The essence of a chart is the patterns you discover, buried under all the junk. By making your charts smaller you are force to remove that junk. Finding this “essence” is what sparklines is all about.